Hello there! Biocadence is growing, and will continue to deliver accessibility to sustainable living solutions, and strategies for over-consumption recovery! Please subscribe to the Biocadence blog by entering your email address in the open field at the top right of this page, and clicking “subscribe”. Since launching Biocadence, I have received a sweet surprise: many Biocadence readers are global. As of this morning, Biocadence has reached readers in 54 countries! Along with the consistent evidence of generosity from my readers, this has emboldened me to ask for more. I want to explore the sustainable living practices of our global siblings. Today, I launch this effort, in sharing the first Biocadence, International interview, of Sietske from Spain. My wish is that the descriptions and images will impact you. If they do, please comment. I will love to hear your response! 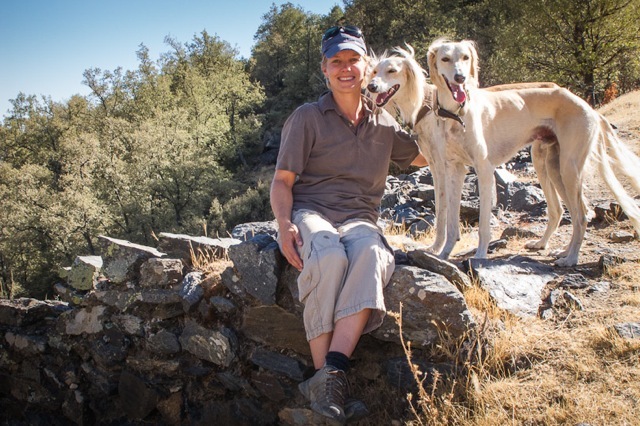 Sietske, Off Grid in Spain – Click here to follow Sietske on twitter. ~ Biocadence: Where do you live? Sietske: In Pampaneira, in the Natural Park of the Sierra Nevada in Spain. ~ Biocadence: What current events have the most impact on your community? Sietske: As we live in a community that is mainly Spanish, the politics of the region and the country are often talked about as well as unemployment and the financial crisis. The rules and regulations of the natural park have a huge impact on the tiny community that we are part of, as the park authority would like to preserve the natural environment while the inhabitants of the park would like to enjoy their surroundings and live comfortably. This clashes sometimes and getting permissions to build is really difficult and time consuming due to bureaucracy. ~ Biocadence: What sustainable living practices are common in your community? Siestke: Every family/home in the park is off grid, so water comes from the spring and electricity is generated by solar power. We are not connected to sewer systems so everyone has a septic tank on their land which forces you to use biologically degradable soaps and detergents. Each house has a vegetable garden and an orchard that provide vegetables and fruit year-round. ~Biocadence: What do you do for a living? How many hours a week do you work? Sietske: I work our own land for a living and do not have a ‘paid job’ to go to but instead make sure there are fruit and vegetables (needless to say that the vegetable garden is in preparation at the moment and nothing grows there yet). ~Biocadence: How often do you cook at home versus eat out? Sietske: I cook at home every day, we eat out maybe once every 6 weeks. ~Biocadence: Do you know your farmer(s)? Where do you get your food? Sietske: The fruit and vegetable vendor in town gets the fruit and vegetables from farmers in the immediate surrounding areas and villages. I haven’t had time to get to know any other farmers around yet! For now, fruit and vegetables in town, and the rest unfortunately from a large supermarket where we can buy most things we need in one go. We live quite remotely and I would like to minimise going to big supermarkets if we can. ~Biocadence: How do you choose your food vendors? Sietske: I haven’t managed to get to know the best places for different types of shopping yet but bread comes from the bakery (freshly made), fruit & veg from fruit & veg man and meat from the butcher (also fresh). I would like to buy more organic and free range but that is not always easy in meat-loving Andalucia. ~Biocadence: Approximately what % of your diet is meat/veggie/grain? Sietske: Meat & fish 25%, veggie 40%, grain 35%. ~Biocadence: How do you refuel your spirit, energy, and optimism? 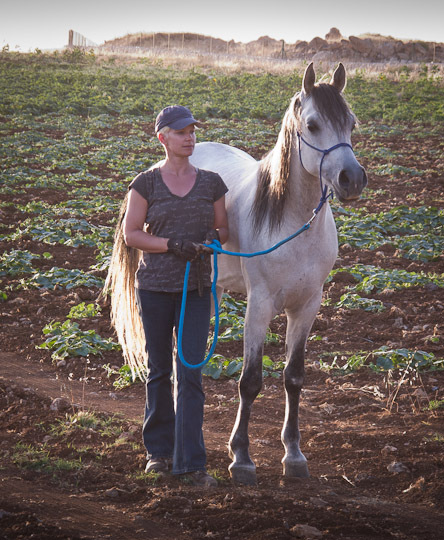 Sietske: I read, listen to music, go for walks with our dogs, ride my horse, enjoy nature, and chat with my husband, friends and family. ~Biocadence: If you could change one thing about humanity, what would it be? Sietske: I would like to remove the importance of religion. ~Biocadence: What sustainable living behaviors did you grow up with? Sietske: To be aware of the use of water and electricity and we never used to eat much meat because it was too expensive to eat daily. ~Biocadence: What sustainable living transitions have you incorporated into your lifestyle? Sietske: We live off grid and I try as much as I can to purchase local products (food and non-food). ~Biocadence: How do your sustainable living practices impact your quality of life? Sietske: It is very liberating to know that you will not receive a bill at the end of the month for your water and electricity consumption. It is amazing to know that you are not registered as a consumer of this anywhere, so ‘big brother’ can’t watch that aspect of your life and it is fantastic to realise with everything you do how much electricity you use (with solar panels you have to keep an eye on the status of your electricity before you use your washing machine for example). ~Biocadence: Why do you engage in sustainable living? Sietske: I have lived in cities, worked for bosses, saved for holidays and done just that what everyone else does because you are expected to do so…. that was fun but as I grew older I wanted different things in life. I also wanted to try and make my dreams come true. One of my dreams was to have my horses close to home (i.e. 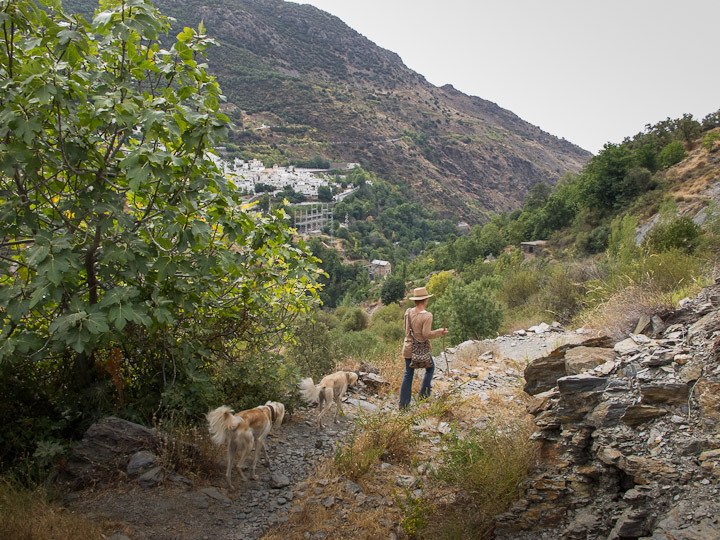 on the land next to the house), have a few dogs (was not possible in the city) and live closer to nature, away from the stress and hastiness of the city. Only when I stopped being busy leading a life that wasn’t what I wanted, dreamt of or desired… only then did my life open up… it became richer: I read more, listen to music again; I have the time to be inspired and the courage to make changes. ~Biocadence: Who are your role models? Why? ~Biocadence: What estimates do you have about the state of global affairs, 50 years in the future? Sietske: I don’t believe the future of the world looks good. Without management of populations (which is a taboo subject apparently) the world population will spiral out of control which will result in wars over basic needs such as food and water. Furthermore the continuous economic growth that every country aspires to is unsustainable, as well as traditional agriculture and the way the banking industry is organised at the moment. This will have to change but I don’t believe politicians are necessarily concerned with what is best for you and me. Politics are run by the large corporations around the world who are not necessarily worried about the wellbeing of the people of the world. ~Biocadence: When you are seeking answers, where do you go? Books and quotes by subject matter mentors? Exercise? Nature? Silence? Discussion with friends and family? Meditation and/or prayer? When you’ve reached your answer(s) and look back on the experience, what pleases you most: the solution you found, or the process that got you there? Sietske: I read, I discuss, I listen and take in. There is not one fix for the questions we have so I do all of the above except for pray. The process is always worth more than the answer because in the process you discover new things, about yourself and others, and in the process much more than that one question got answered. ~Biocadence: What does the verb “to enjoy” mean to you? Sietske: Live life fully, enjoy what you do because it is too short to be miserable. Forget your troubles and enjoy what you have. ~Biocadence: Do you remember a moment when you mastered “enjoyment”? When… where… what were you doing? And, what made it so? Sietske: There have been many: sledding with huskies in Svalbard was the ultimate enjoyment of silence / riding my horse is the ultimate enjoyment of feeling connected with an animal / but also smaller and more ‘daily’ things such as eating delicious food, drinking wonderful wine / a kiss from your loved one, etc. I asked Sietske if she’d like to feature a link to an organization that has impacted her positively. She offers www.populationmatters.org, as their website is excellent, with a wealth of information. I hope you’ve enjoyed reading about Sietske’s off grid sustainable living adventure, as much as I have!!! I really enjoyed this interview and look forward to more! I loved that you included pictures! Hi there. Thank you for visiting and commenting! I put a good deal of effort in, but because I love it so much, it can often feel easier than work should feel:). I appreciate your support. Thank you! It’s a favorite of mine, as well! I appreciate your visiting. Wow, thank you! Some day, maybe. I’m working on it, that’s for sure! Thanks for visiting! Thank you! Some day, Biocadence will be ranked higher:). I’m just getting revved up and having so much fun learning the blogging curriculum. Thanks for visiting! Hi. I don’t have a contact page. I will have to make one ASAP! Feel free to email me at biocadence@gmail.com. Thank you for the consideration. Have you given any kind of thought at all with translating your current web-site into French? I know a few of translaters right here that will would help you do it for free if you want to make contact with me. I speak a bit of Spanish and have considered translating to Spanish. But have not thought of translating to French until I read your comment. Tell me more about what I need to consider to make the connection, and thank you for the thought! Is it okay to place a portion of this on my webpage if perhaps I publish a reference point to this webpage? Yes it is! What a compliment that would be! Please message me your link when you’re done- I will love to read it! Yes, that is okay, so long as the source is clearly marked! Please let me know when you do, so I can take a look at your work! Those words make me very happy! Thank you for visiting! Thank you for linking to Biocadence! We appreciate your support, and look forward to reading more from you.